Weve captured the ethereal beauty of watercolor paintings in this wondrous display of fresh flowers such as dahlias, Asiatic lilies and ranunculus in glorious shades of pink, orange and yellow. A splendid gift for any occasion. 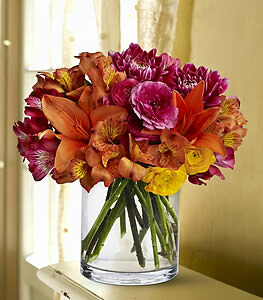 A mix of fresh flowers such as ranunculus, dahlias, Asiatic lilies and alstroemeria in shades of pink, orange and yellow is delivered in a clear glass cylinder vase. Thank You! The recipient received the flowers today and was very pleased with the arrangement and overall presentation.